There is a growing consensus that it is important to be able to assess the value of research infrastructures (RIs), not only for research, but also for the society at large. But currently there is no unified framework for the impact assessment of investment in RIs. Various conceptual frameworks exist in parallel comprising a range of observable direct and indirect effects and longer-term impacts, in particular economic impacts. However, most of these studies and frameworks do not concentrate on Social Sciences and Humanities (SSH). 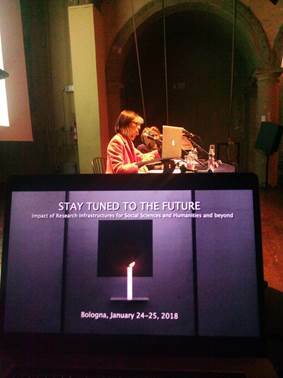 The international conference “Stay tuned for the Future”, organized on 24-25 January, 2018 by the ESFRI Strategic WG on Social and Cultural Innovation in collaboration with the Foundation for Religious Sciences ‘Giovanni XXIII’ in Bologna, focused on the societal impact of RIs for SSH, and on the broad scale of types of impact and methodologies for their assessment. Leonie van Drooge presented the approach the Rathenau Institute develops for ACCELERATE, in relation to scientific RIs, that will allow providing measures for fostering their long-term sustainability. Given that a broad range of diverse impacts are expected from and intended by RIs, the key question discussed is what impacts are relevant at a given time for a specific RI. This issue, which is also on the agenda of the ERICs in the Social Sciences and Humanities, was therefore widely discussed, taking into account and transferring to the SSH community the outcomes and best practices developed in the framework of ACCELERATE. Watch the video and download the presentation by Ms. van Drooge.